JoAnn Corley-Schwarzkopf | NewSchool Management: What Do You Think About Your Ability to Think? I was thinking about thinking the other day. I'd just completed an executive leadership learning roundtable with a client based in Kuwait. (All of their executive team was present from Dubai, Bahrain, Jordan & the US. -- isn't technology just amazing!) They are serious about cultivating a culture of innovation and know that it needs to start with the leadership, so they are taking advantage of our virtual leadership development offering. The roundtable theme was Power Up Your Thinking, the focus of which breaks down very practically the fundamentals of what it means to be a better thinker...which also means better problem solver, better collaborator among other benefits professionally and to an organization. Side note: I know "design thinking" is becoming very popular, yet at its more basic level, teaching folks how to think is an important prelude to it. I don't know about you, but I am finding this to be truer than ever!...and this was written back in the 1960s!!! As I've worked with human potential in organizations over the years, I have come to the conclusion that nothing could be a more useful, worthwhile and profitable investment than teaching employees, key leaders, and managers how to think. Why? Because thinking is at the heart of running and growing a business, it's a leader's #1 business asset, and learning how to think involves a variety of activities with incredible, profitable benefits. 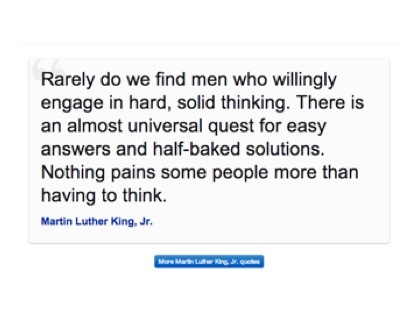 Unfortunately most leaders don't know and understand what robust thinking looks like nor how to practically do it. We in our business culture frequently use different types of "thinking" terms in conversation without, for many, really knowing what they mean or how to demonstrate them. Here are a few: strategic thinking, creative thinking, innovative thinking, design thinking and their corresponding partners: problem solving, process improvement, decision-making, and judgment. I call these pieces of the thinking puzzle or key elements of a thinking toolkit. 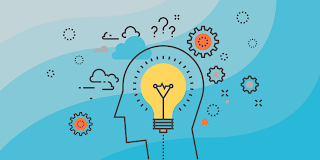 To become a "power thinker", you not only need each of these capabilities in your thinking toolkit, but need to be able to do each reasonably well...and in order to achieve that, you have to know what they are. To gain a basic understanding, we worked through definitions and from the roundtable there were some wonderful "ah has". 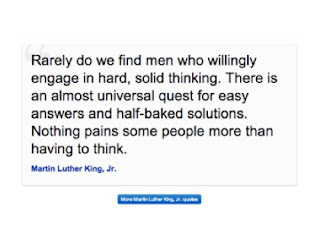 For example, some of the definitions included terms like methods, process, disciplined, all which inspired a conclusion that leaders need to give their team members time to think!...or, as King said, the solutions may well be half-baked. Think about this for a moment. Often, leaders want answers quickly, and even accuse people of not being "smart thinkers" if they don't come up with potential options or solutions in a short time frame. Good thinking, power thinking requires time. Leaders need to give team members, permission, space to think! And, leaders need to not so much tell people what to think, but teach them how to think! Consider the benefits...here's a few: ownership, buy-in, mapping a practical path forward, constructing progress, learning to value differing views, a resource for working through conflict (that's a big one! ), reduce employee problems, developing and or discovering talent, mining ideas for greater business success, nurturing openness and humility, bolstering engagement ...you could probably add more. I often say leaders need to host a creative thinking workshop at least once a year (another very misunderstood form of thinking by the way and the foundation of power thinking), because at the center of the power thinking puzzle is creative thinking -- all other thinking types hinge on it! In fact, it is the essential element of each. Everyone needs a power thinking tune-up from time to time! Read this: 11 Reasons Why Every Company Should Have a Creative Thinking Workshop...at Least Once a Year. So, how is the thinking in your organization? ...among your leaders and managers? Are your leaders teaching, training their folks how to to think? Do they work with practical methods to get the best results? Is process improvement a practiced part of your company culture? A final note: Many companies want to have an innovative, learning culture, yet don't know how to make that a reality. If this is true of you, let us help. We've been working with companies to jumpstart this for a number of years throughout North America. And now, with our virtual offerings - we are starting to do so globally. // JCS Business Advisors is a strategic business management consultancy. Through our expertise in human behavior, we develop high-performing leadership teams and organizations as we partner with forward-thinking senior leaders, entrepreneurs and their HR counterparts. We help them bridge the knowledge & execution gap of connecting people, performance, and profits.